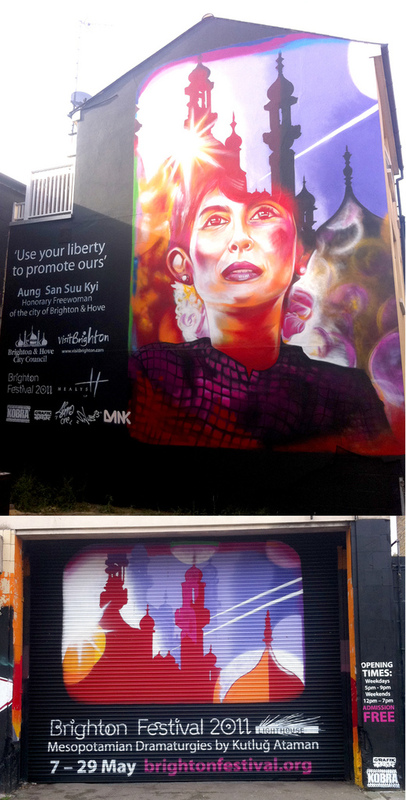 May was no exception with youth projects, community works and an invitation from the Brighton Festival to produce a large scale mural to honour the Burmese political leader and freedom fighter, Aung San Suu Kyi. She was this years festival curator and was also made ‘Honorary freewoman of the city’. The mural was completed by Grafik Warfare members, Dan Kitchener and Snub23, as well as myself. The main image was completed in just a day with the help of a scissor lift and lots of paint! Lettering and logos were created using stencils. 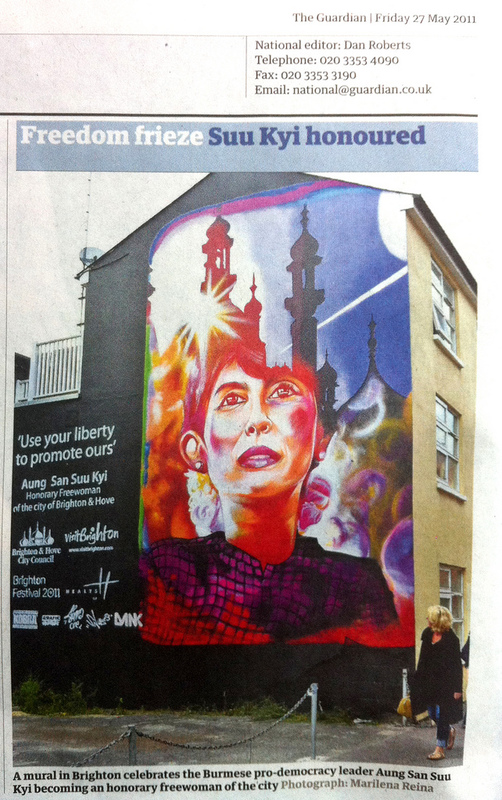 The original design by Harrison and Co.was taken from the brochure of the Brighton Festival and depicts Suu Kyi looking over Brighton. The finished wall now stands proud on Kensington Street in the North Laines area of the city and was featured in the Guardian a few days after completion. There was another Sinna and Snub collaboration on a shutter in Circus street to promote the exhibit by Kutlug Ataman. This design was the back cover of the brochure. More info on the Grafik Warfare collective.